The 21st and final ZEPS bus loaded and ready to be delivered to IndyGo. Complete Coach Works (CCW) delivered the last of the 21 rehabilitated Zero Emission Propulsion System (ZEPS) powered electric buses to Indianapolis Public Transportation Corporation (IndyGo). The remanufactured ZEPS bus is rebuilt with lightweight flooring, low resistance tires, and energy-efficient heating and cooling, while ensuring a reach of 130 mile range on a single battery charge. Each 40-foot electric bus carries 36 seated passengers plus standees and is equipped with air operated doors, brakes, suspension, hydraulic power-steering, stainless steel bike racks, LED lighting and lightweight seats. “The buses look remarkable, almost like brand new buses,” said IndyGo’s Director, Maintenance, Victoria Learn. The ZEPS powered buses create significant carbon savings by eliminating activities involved in manufacturing a new bus. 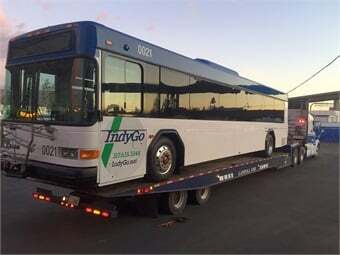 IndyGo now has the largest remanufactured electric fleet in the country. The rehabbed buses were acquired at a fraction of the cost of new all-electric buses, helping minimize cost and environmental impact. “IndyGo is proud to be a transit leader in alternative energy. We feel it’s important to push the envelope and utilize newer technologies to make our operation as efficient as possible,” said IndyGo’s President/CEO Mike Terry.